We’ll use your data just to send you regular updates on our plugin. We’ll not provide your personal data to third part companies. 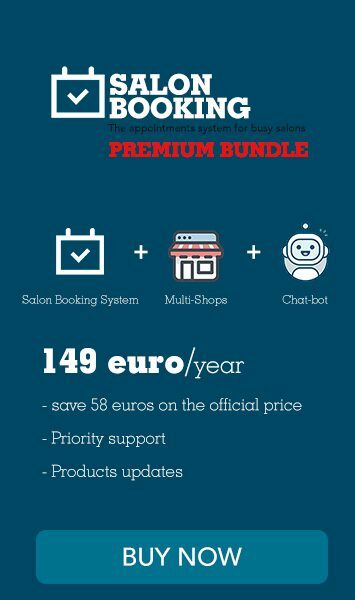 If you have already installed the free version of Salon Booking Plugin and are ready to switch to the PRO version you can follow this short guide in case of doubt on how to complete the process. This guide is for those who purchased the PRO version from our official website and not for those bought Salon Booking from Codecanyon. After the purchase you’ll receive a an email receipt with a link where you can download your copy of PRO version. Download the zip folder and then upload to your WordPress install. Before activating the PRO version you need to deactivate your FREE version. Don’t worry, you won’t loose any settings. Once the the FREE version has been deactivated you can then activate the PRO version and if you want you can even delete the FREE version of Salon Booking from your WP install. Once the PRO version is active you need to activate your license too. You can find your license key inside the same email receipt. then click on “Activate license” button. If everything has gone well you will see a green check icon. and be redirected to your personal “Purchase history” page where you will find all your purchases and from there you can download your plugin copy and get your license key. Sometimes it could happen that you are not able to activate the license key. This issue is due to the settings of your hosting partner where c_url library is not installed. In those cases please contact your hosting and ask for a solution. What’s new on Salon Booking plugin 2.3 version?